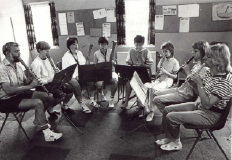 The Schwanewede Recorder Consort was made up of a group of young amateur musicians who were members of a musical association known as the "Klingende Runde für jung und alt, Schwanewede". The "Klingende Runde für jung und alt" was founded in autumn 1978. The main objects of the association were to further the musical capabilities of its members through public performance and to enhance the cultural life of Schwanewede. At its height, the association consisted of three musical circles and a folk-song ensemble. The consort was one of the three circles and contained the most capable musicians. The association and the consort disbanded in 1984. There is still a substantial contact between some of the former members, not just amongst themselves but also between host families and organisers in Worcestershire and Yorkshire. There is some discussion of a "Reunion Tour 2002" commemorating the 20th anniversary of the consort's first tour in Worcestershire in 1982. watch this space! Tours of Hereford/Worcester (1982) and West Yorkshire (1983) with notable public performances at Huddersfield Town Hall (21.06.83), BBC Radio Leeds (23.06.83), St. Paul's Hall, Huddersfield (24.06.83) and Harrison House, Halifax (29.06.83).